My company had a gift basket of pet products that was to be delivered to downtown Manhattan, but was held up at the Canada/U.S. border. It HAD to be delivered by Dec 20th, end of day. On Dec. 20th I found Petweb Express who delivered products in NYC, and did they ever go the extra mile. Not only were they able to replace all the products that were originally shipped, they even put it all in a gift basket and delivered it WITHIN hours of me placing the order. They had it delivered by end of day, and Julie at PetWeb Express kept me up to speed on status of the order throughout the day. This is customer service you usually can only dream about, but PetWeb Express were able to deliver (literally and figuratively). Anyone looking for Pet Products in New York City, or to be delivered in New York City, should look no further than PetWeb Express. Joseph Jaffe would be proud! My family and I had lunch at the Chick-fil-A in Destin, FL last weekend. This was our second visit in the last several months and we all found the experience to be one of our absolute BEST customer service experiences ever! What I found remarkable about this is that we had the same incredible service there during our first visit as well...can there actually be a fast food restaurant with incredible food and service...ALL the time? My experience says YES! We've got 4 young children, so entering a busy fast food establishment with lots of people and other stimuli can be a little overwhelming to say the least, trust me on this! This restaurant immediately recognizes this and does literally everything they can to make it a pleasurable family dining experience. They welcome you as soon as you walk in the door, deliver the food to your table, check on you several times throughout your meal, refill your beverages (plenty of refreshing Coke products) and literally helped us put the jackets on our little ones! They have truly made us feel right at home and like family. According to their website, Chick-fil-A desires to "have a positive influence on all who come in contact with Chick-fil-A" Well, they should be issuing this particular store and its owner, Mr. Morris Loveland, one of the largest trophies ever made for all to see, appreciate and learn from. He was on site, a pleasure to do business with and only humbly admitted that he was the owner when I asked directly and complimented his staff. He truly embodies the spirit that Truett Cathy has instilled in this family run company. Thanks Mr. Loveland for the great service and lesson in how to sincerely treat a customer like royalty. We WILL continue to be a very frequent customer of Chick-fil-A and look forward to returning to this particular store again and again and again. AT&T and iPhone has become oil and water from a customer experience standpoint, but hopefully with the launch of "Marks the Spot" iPhone App, they'll begin to turn things around. In a nutshell it's an app that AT&T customers can use to register dropped calls, failed call attempt, no coverage, data failure or poor voice quality and match that against both frequency (once, seldom, often, always) as well as the GPS location. Once submitted there's a SMS verification. I guess it's no different than a typical Windows notification of a crash back to Redmond HQ, but it's good to see AT&T stepping up and being accountable. Still TBD is whether any customers will actually participate and contribute i.e. what's in it for us? 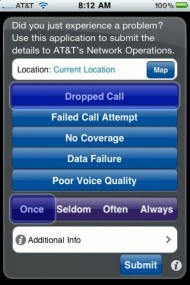 and also how AT&T intends to both close the loop i.e. actually use the feedback and more importantly, connect back with the customer to give them a progress report/update.